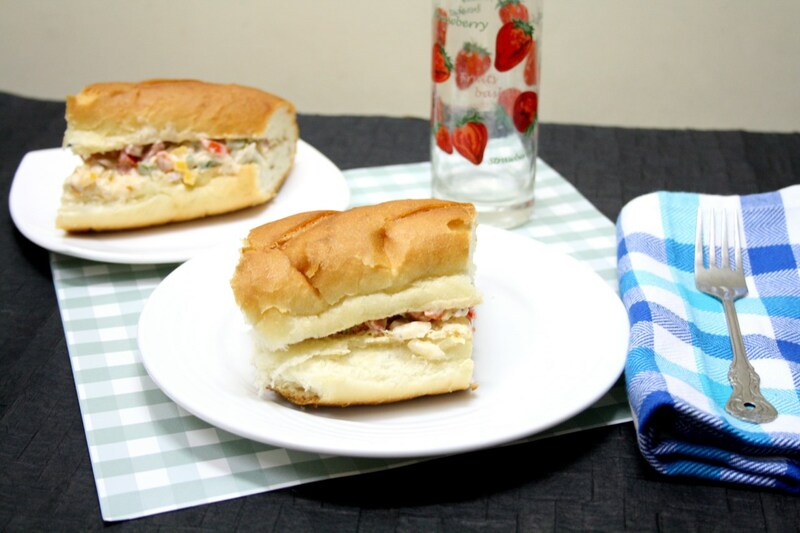 For the second day of Healthy Breakfast for Kids, I made this Bell Pepper Cream Cheese Baguette Sandwich. Peddu when he went shopping with his dad, he got a huge Baguette bread. I almost wanted to use it for my French Theme, however knowing I should be making it from scratch and not use ready made bread, I decided against it. Everybody were wondering what we should make with such a huge one, as there were already two more loaves at home that point. Hubby dear said he tried persuading Peddu not to buy, he was adamant. So it came home! This was the first time I was tasting this bread and it tasted awesome. It was crusty and tough on the outside and so very soft inside. I knew that texture might prove quite challenging for myself. Anyway since I had the bread, I now had to come up with options to make use of it. I made a huge batch of Cream Cheese. I made me decide that I could use that along with some vegetables to make it an healthy breakfast option. 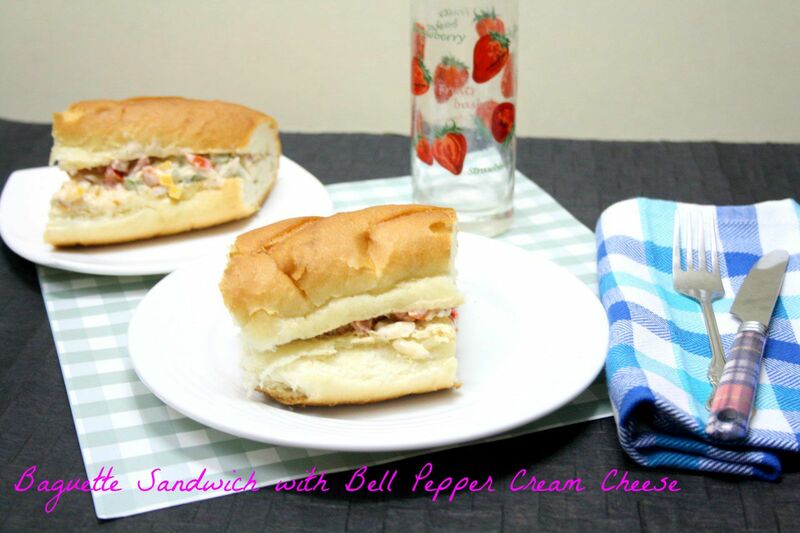 We always stock bell peppers of all colours, but this cream cheese was very tempting to make. Everybody loved it, especially Amma who wanted to know right away on how I was making the Cream cheese. Unlike the last time, the process this time was quite lengthy and I was also making more quantity. 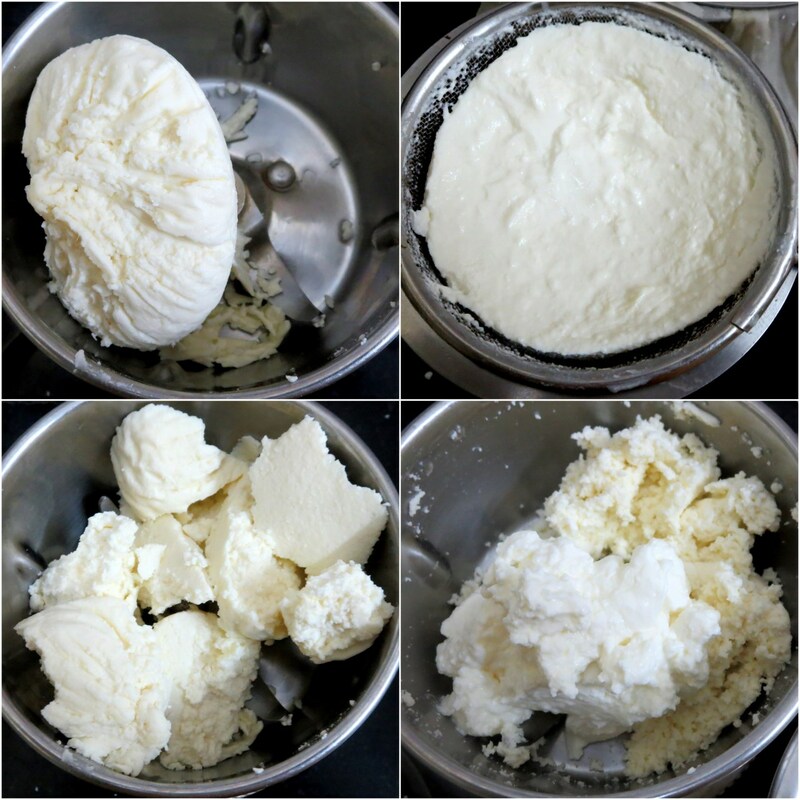 I made with a liter of milk for the Paneer and almost half a litre of curds. Both were hung overnight and then after blending it again was refrigerated hung for nearly 5 hrs. The resultant cream was simply awesome! The process of making the cheese cream might sound daunting, I will surely recommend making it yourself, as its economical, tastier and much more loved than the store bought one. Once you have the Homemade Cream cheese ready, scoop in as required, add salt and pepper. Beat well till well blended and creamy. Heat a pan with olive oil, saute finely diced bell peppers, add salt for seasoning. Simmer for 5 mins, till it becomes a sort of soft. Allow to cool, then add this to the cream cheese along with fresh onions and tomatoes. Adjust seasoning as required. 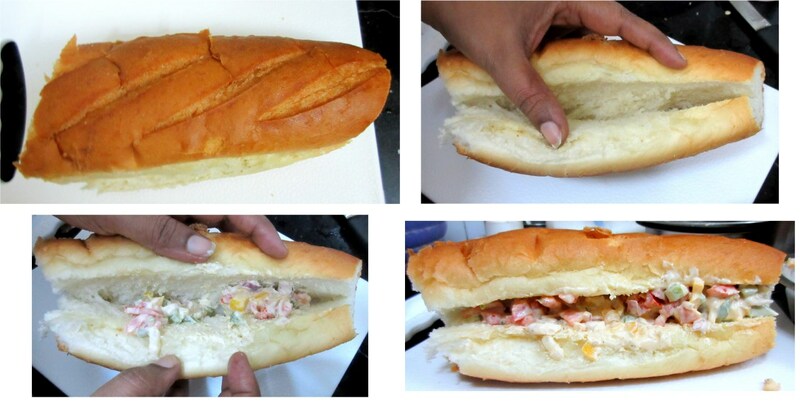 Slit through the bread in the middle, stuff with enough filling and serve right away. If you want you can toast it for couple of mins as well. I MW the bread so that it becomes soft. The soft and crunchy filling was great. 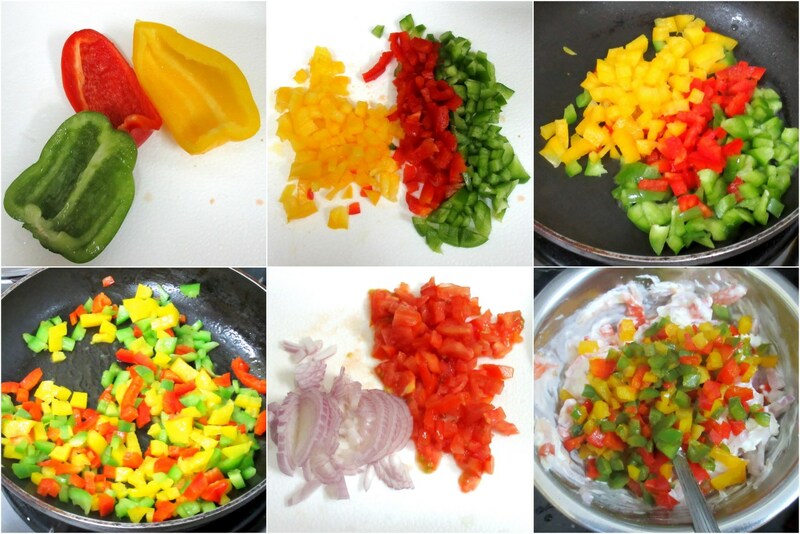 If you are used to eating raw capsicum, you can skip the sauteing step. Sending this to Lavina, who is hosting my Kid’s Delight Event, themed on Healthy Breakfast for Kids. Come, join us for Breakfast with this delicious Sandwich! 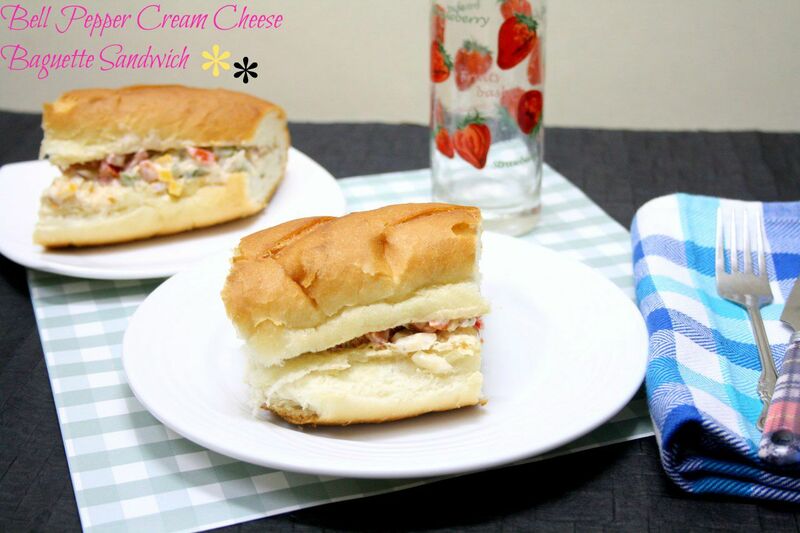 What a creamy & delicious sandwich. 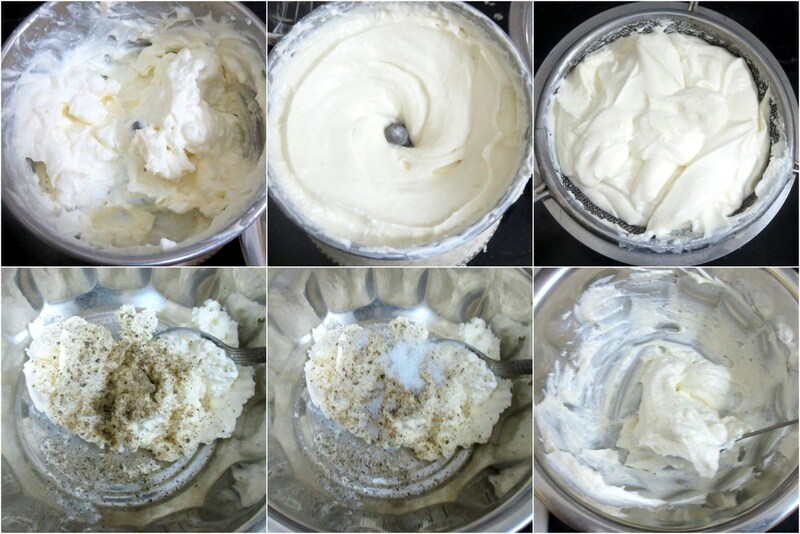 Making cream cheese at home sounds awesome. A healthy and filling sandwich. Very colorful with all the colored peppers. These days my older one is fond of these cream cheese sandwiches. Such a healthy and creamy sandwich. Lovely sandwich! Have bread will try! !